It’s science class in the third grade, and your teacher hands out these tiny little seeds. She tells you that we are going to grow these seeds in a wet fold of paper towel so we can watch the mysterious actions of a seed opening up and growing. 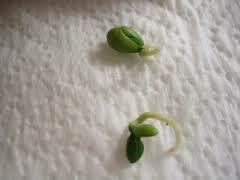 The whole class gets busy wetting and folding their paper towels embedding the seed, usually a bean sprout of some kind, into the folds and slipping them into a glass jar. Over the next few weeks we all watch anxiously. Class only gets started when the teacher is able to pull us away from the window where we go every morning to see if this is the day our seed will open and send it’s roots down, it’s stem up. Some of us are less than careful and our paper towels dry up, the seed dies. Others are too anxious and water over and over and the seed is soaked. Those who strike that happy medium are rewarded when their seed starts to open and a slender white root probes the paper towel looking for dirt and ground. The whole class wants to see and we all crowd around the lucky first one. The mysteries of the earth are exposed, laid bare before us as we stare in amazement. We wonder how it knew to open, how it knew which side was up and which was down. Even as we see what was formerly hidden in the dark of the earth more mysteries beckon. The kingdom is like a mustard seed, Jesus says, from the smallest of beginnings, in the dark of the earth, in the unseen places, it will grow and become a tree! It’s hyperbole, an extravagant and untrue statement. It forces us outside our prior understanding by suggesting something we know can’t be true. Mustard seeds don’t become trees! Acorns become mighty oaks but mustard seeds? They stay pretty small, just your average bush, really. Reason insists that we know our limitations just as the mustard seed isn’t a tree, we know we too have limitations. We are a small church in the middle of a small, mostly rural area. We have our limitations. We are an aging group with declining numbers, we know our limitations. Don’t we? It’s easier to see the rose bloom than the seed sprout. The rose is out in the open, warming in the sun. We can watch its petals slowly spread out. The seed, however is hidden, in the depth of the soil and the dark, wet of the earth. Weeks can go by without any visible sign of change, of growth. Before we grew our seeds in wet paper towels we grew grass seeds in a dixie cup filled with dirt. Do you remember that? I suspect that my third grade teacher knew how often we had looked at that bare dirt and failed to believe anything could possibly be growing in there. it’s so hard to believe that change is happening when you can’t see it. As a child I wanted to dig in and see what was happening underneath all that dirt and I didn’t trust that things really were happening. I needed to see it. At the gym where I work out there is a poster in the bathroom, in that most private of places where a woman might look at herself in the mirror and get discouraged because all that hard work and dieting isn’t making the difference she’d hoped for. It says, “When you get discouraged, imagine yourself a year from now, and get back to work.” It’s part of our nature, I guess, that we want to see our hard work and our brave risks produce change now, visibly, let me see it happening! But the process begins within the dark and unseen places. Jesus says the kingdom is like a, that is one, mustard seed, that a man took out into the field and planted. Imagine going out into the field and planting that one singular mustard seed. It’s such an insignificant thing. To plant that one seed. Here we are hungering to see change happening, to see our efforts manifesting, and he says it’s like planting one, tiny, insignificant seed in a field. And then things happen, somewhere in the dark soil this seed opens and grows and becomes, more than we ever could have expected, not a bush but a tree! The smallest thing, perhaps some passing kindness, a smile, a thank you, a gracious welcome, a bit of attention, planted faithfully grows into something incredible, grows into the kingdom! We struggle with the desire to see things happen but silently in all the dark quiet places, what we have planted grows and becomes! Under the surface and out of sight change begins and growth happens! Simple words planted on a sheet of paper left in a cold and bare attic where trauma occurred. Simple words which stir the heart and break open the brittle shell of resistance. We do have a piece of good news. We are good news. We are the seed planted out in the field and we do not know what we might become; we do not know what we can accomplish; we do not know what our potential is! We have only to break through our resistance and stretch our roots down into the soil, that good rich ground that is the Word of God, that is our source and our sustenance and grow! Lao Tzu said, “When I let go of what I am, I become what I might be.” But this letting go, this release of certainty, this cracking of our defensive, protective shell, it’s really hard to do! And when we do, we want promises! Ezekiel 17 speaks to the captives, those who have been stripped of all power and privilege and taken hostage in Babylon, taken hostage to insure the compliance of the rest of Israel. Moments after Ezekiel warns the Israelites not to seek the protection of the even more powerful and just as likely to plunder Egyptians in order to overthrow the Babylonians, he promises them that God will pluck out a fine shoot from their branches and establish it on a high and lofty mountain, and it will put out branches and bear fruit. From the depths of exile and the fate of a hostage, this small cutting, this soon to be grafted on branch will grow to become fruit and refuge to every bird of the air. But the Israelites don’t see this happening. They only see themselves stuck in an abusive hostage situation and maybe, just maybe, the Egyptians would help them out. Maybe they could force the situation and free themselves. Maybe they could take control and make things turn out the way they want it to. Or, Ezekiel says, they could wait for God to act. Or, Ezekiel says, they could have patience with the process of change that is going on under the surface, unseen, in the hidden and dark places, the inaccessible places. Oh but how they wanted to make things happen right now! And don’t we all? It’s so hard to be patient with these slow, internal processes, to trust that things really are happening and growth and change are occurring. We are planted like a tiny seed in a vast field. We begin our growth and our transformation in the dark of the soil, rooted and grounded in God’s Word. We begin our growth in the darkness and in the unseen internal spaces. How often do we want to pluck that seed out of the soil and look at it, just to see if it’s really doing something? How often are we tempted to “push the river” and try to make it go faster? How often do we look towards the powerful and mighty around us and seek to be like them, to emulate them, to adopt their DNA instead of allowing our own to grow and manifest God’s glory just as God intended. Instead we look at those around us and we wish we could be like them. But we are still that small seed. That unseen seed planted in a large and vast field. In our own way and in our own time, God will use us. We will, and are, moving from the isolated self-protected state of a seed to the expansive, spreading, branched out state of a tree, sheltering all manner of life. Isn’t that amazing? The world would tell us to maintain our hard-shell of protection, to care for ourselves and our needs, but God says, no, break open and grow, break open and search for me. It’s a risk, and as Anais Nin acknowledged, it’s something we tend to do only when the pain of staying closed in on ourselves gets to be just too much. Can we trust that if we do allow ourselves to break open, to stretch deep inside and deep down into the darkness that we will find sustenance, that we will be nurtured, and that all of this can and will go on for some time, perhaps a long time, before the first shoots of new growth begin to show above the surface? Can we be faithful as we wait for these shoots to show up, to continue watering our little seed and resist the urge to unearth it and check to see if it’s really doing something? Can we have faith that growth and bearing fruit is part of our DNA even when we don’t know where or when that growth may occur? We know what we are, and it is tempting to hold onto that with a tight, white-knuckle grip, but we do now know what we might be, or how God will use us. Learning this requires release, it requires surrender, it requires allowing the process to continue, even when we don’t see signs of success or immediate relief from our anxiety. The kingdom of God is like a mustard seed planted in a vast field, and the church is a foretaste of that kingdom. Today we are the mustard seed, planted in the heart of the piney woods in southeast Texas. We grow unseen and undisturbed at first, we grow simply and without concern as God is our gardener, our pruner, our sustenance and our joy. We stretch our roots deep into the soil of the Word and are fed and sustained. 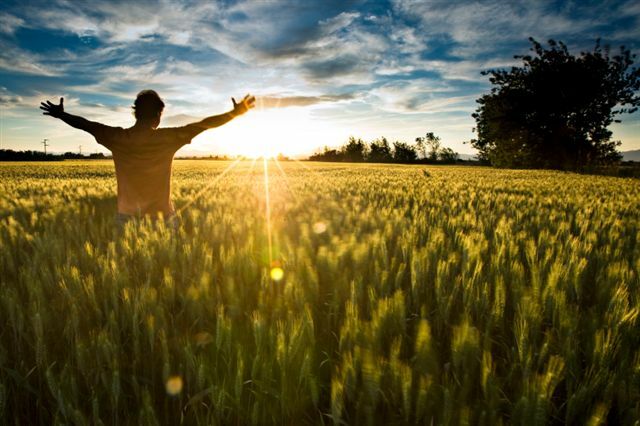 We stretch our hearts and our hands to the love of God which warms us and fills us with all manner of good things. We know that it may be a while before new shoots begin to surface, but we are content. We are, after all, just a seed, small and simple, planted in a vast field. Next postGood Fruit, Bad Fruit, Strange Fruit; How can we not lament?